LONDON, England (April 26, 2011) -- Rockstar Energy Drink driver Tanner Foust had a strong start to the European Rallycross Championship season this weekend in southeast England at the 2011 season opener. "I think our times this weekend show how well the team and the car can work," said Foust, who is contesting his full season in the championship after making a successful series debut in select events in 2010. "It shows great promise for the championship this year." Foust was competitive from the start in the Rockstar Energy Drink Ford Fiesta, consistently setting top times on the challenging Lydden Hill rallycross track. He achieved the second-fastest overall time during the official timed practice session on Saturday, finishing only one-tenth of a second off of defending champion Sverre Isachsen. But while Foust demonstrated that he had the speed on the track, some bad luck knocked him out of podium contention. After two days of competitive, door-to-door action, he finished in eighth place overall. "Sometimes luck just isn't with you on the track," said Foust. "When everything was working 100 per cent, we were consistently in the top three. Unfortunately, that doesn't get you championship points, but it does show that the potential is there." The Ford Fiesta rallycross car, prepared by the Olsbergs MSE team, is running a new engine set-up for 2011. While the vehicle performed well at the start of the weekend, an issue emerged that saw both team vehicles sporadically down on power as the racing progressed. Even so, there was no question that newcomer Foust and veteran teammate Andreas Eriksson won the hearts and minds of the thousands of spectators that packed the race circuit under warm and sunny skies Sunday and Monday. The two battled through several races door-to-door in their nearly identical, top-spec cars, delighting fans with tandem slides through corners and multiple passes. The event was Foust's second rallycross competition this month. He took the win a week earlier in the nascent Global RallyCross Championship series in the United States - even after dislocating his shoulder during tough racing. 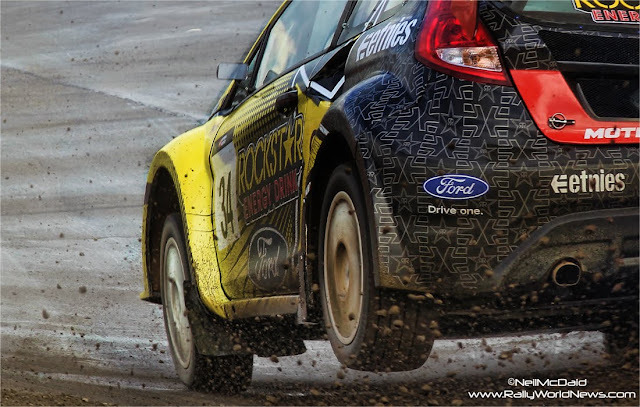 Rallycross is a blend of circuit racing, off-road racing and rally competition. It promises intense crowd-pleasing action in a fan-friendly track environment. As many as six drivers line up to start at once, piloting high-horsepower compact cars through race traffic over a challenging short course that features jumps, unbanked turns, hills and transitions between pavement and gravel. Foust is the first American to compete in the European Rallycross Championship. In addition to rallycross competition in Europe and the United States, Foust's 2011 competition schedule also includes a return to X Games Rally Car Racing events this July. His next contest takes place May 14 and 15 at the Pista Automóvel de Montalegre, in Montalegre, Portugal. ABOUT TANNER FOUST Tanner Foust is a versatile and multi-talented driver known for his supreme car control and a proven track record of podium placements and national championships. When he isn't racing, the professional driver also performs in films and on television. He is an on-air host for the US version of the seminal BBC auto show, Top Gear, on HISTORY. His stunt driving includes performing as a lead driver in the Fast and Furious: Tokyo Drift, Bourne Ultimatum, Dukes of Hazzard, Red Dawn and Iron Man 2 movies, and also handles stunt driving in numerous popular TV shows and commercials. FOR MORE INFORMATION visit http://www.tannerfoust.com/.